The Algarve (which is translated as “The West”) is the most Southerly region on mainland Portugal, and has a lovely scenery, blue skies, and a variety of different landscapes. While the regions around the beaches are often very busy during the school holidays, and the main seasons, there are some areas in this beautiful region of Portugal that remain fairly unspoilt by tourism, and if you travel outside of the school holidays, then you will also be able to find good spots on the beach without having to find your way past hundreds of other people. Less than half a million people live in Algarve. 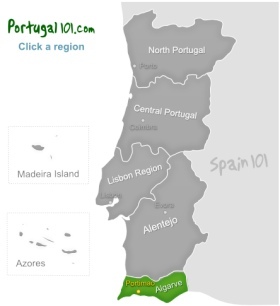 Thanks to tourism and good industries(agriculture and horticulture are important for the income of the region), this region of Portugal is currently the third richest region in Portugal. 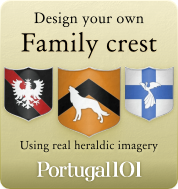 It is known as the most popular region for tourism in Portugal, and is also regularly listed as one of the most popular holiday destinations in all of Europe. The beautiful beaches, the wonderfully blue skies, and the good weather all year round are some of the reasons why the population of the Algarve sometimes triples during the summer months when the tourists from Portugal and other countries flock to the white beaches with the crystal-clear blue waters. The region is also known for its high quality and beautiful pottery, ceramics, and tiles. The pottery is hand-painted and very popular as souvenir for tourists. What should you see if you visit Algarve? Faro is the capital of the Algarve region, and a good point to start your exploration of the region. Sights that are usually visited by tourists are the Faro Cathedral, the Estoi Palace, and the City Hall. It is also a nice experience to talk a walk along the Faro promenade, and simply walk through the streets and alleys of the city centre. Faro is quite popular with people who like to party during the summer months, so you will often get the feeling that the city is not very authentic during those times. If you would like to experience Faro as it usually is, then going there is the “off” seasons is a better idea. Lagoa (an area within the Algarve) is mainly popular because of its lovely beaches, but there are also sights like the Convent of Saint Joseph, the Castle of Abenabece, the Church of Our Lady of Light and the lighthouse of Alfanzina. There are nice villages that you can choose as your base to explore the coast and some of the inland attractions (if you can manage to pull yourself away from the breathtaking beauty of the coast). Albufeira is a good destination if you would like to see some of the few remains of the Roman occupation of the region (the Roman Bridge of Paderne), and visit a Moorish castle (Castle of Paderne). Of course, Albufeira also is quite popular with tourists because there is good access to lovely beaches. However, Albufeira is also a good destination for people who would like to add some history and culture to their beach holiday. Lagos is a very popular town with visitors, and counts as one of the most visited places in Portugal, especially during the holiday season – so if you can, try to travel at other times, especially if you would like to experience a more authentic Portugal! Lagos is so popular because it has a great mix of beaches, culture, art, and events. Some of the sights in Lagos (just to name a small selection) are the Ponta Dona Maria (a bridge), Fonte Coberta Dam, the barracks of the Guarda Fiscal of Lagos, the Lighthouse of Ponta da Piedala, the regional museum of Lagos, the Church of Santa Maria, the Hermitage of São Pedro de Pulgão, the Ruins of the Convent of the Trinity, and the Fort of Ponta da Bandeira. 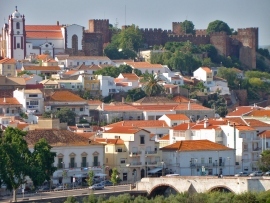 Lagos is a great place to learn about the history of the Algarve region. If you really want to explore the area around Lagos, including all the ruins and historical buildings, you need to plan in a few days. If you are after a proper tourist complex to have a resort holiday with everything you could ask for from such a place, then you should head to Vilamoura. It is one of the largest places of the kind you can find in all of Europe, and you can be sure that you can have a good, relaxing holiday there. If you would like to get away from the tourist resorts and crowded beaches, you can head into one of the national parks of the Algarve, e.g. 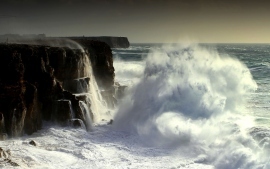 the Costa Vicentina Natural Park. The Algarve has some great hiking opportunities, and if you head a little further inland – away from the beaches – then you will find a completely different landscape with a lot more peace.